In the Basque city of Bilbao tonight, up to 100,000 people will march in a silent demonstration for the repatriation of hundreds of Basque political prisoners. Under the Spanish government’s policy of ‘dispersion’, 463 Basque prisoners are being held in more than 70 jails across the Spanish and French states at distances of up to 1,200km from home. The policy has violated the human rights of thousands of Basque prisoners since its introduction in 1989 but is viewed by the overwhelming majority of Basque society as especially repugnant today, following the announcement by ETA (Euskadi ta Askatasuna – Basque Homeland and Freedom) of a permanent ceasefire in 2011 and its subsequent disarmament moves last year. Those who will march this evening are not demanding amnesty or special treatment for the prisoners – they are calling for an end to the exceptional measures used by the Spanish government to isolate and demoralise Basque political prisoners, and to punish their families and broader Basque society. The demonstration has been called by ‘Sare’ (Network), a broad-based civil society organisation launched last year with the goals of building a mass campaign for the resolution of the status of Basque prisoners and exiles. The prisoners have all been labelled as terrorists by the Spanish government and judiciary. Some of the prisoners have been convicted of membership of ETA or ETA activities. Many others have been convicted of membership of political parties or organisations that have never been associated with the use of violence. Some have been convicted of terrorism for minor acts of sabotage during street protests, and still others have been jailed for expressing political opinions. Journalists, students, youth activists and lawyers are among the prisoners. Since 1998, the Spanish judiciary has implemented a criminalisation strategy that claimed ‘everything that surrounds ETA is ETA’. Any political party, newspaper or cultural organisation that supported Basque independence was deemed to be part of ETA. As well as the Law of Political Parties, which criminalised membership in Batasuna and other non-violent political organisations in 2002, the law against “glorifying terrorism” has been used to jail journalists, editors, and elected political representatives. Over the past year this law has led to terrorism charges against dozens of youths for their social media posts, including, for example, a post of a map of the Basque Country with the word ‘Independence’ on it. In February last year a 36-year-old man, Arkaitz Bellón, died in a jail in Andalusia. His experience of the Spanish justice system was unfortunately typical of Basque prisoners and involved harsh sentencing, beatings in jail, repeated transfers and dispersion. Arkaitz died more than 1,200km from his home. He had been jailed for “terrorism” for 13 years for his involvement in street disturbances and was just a few months away from completing his sentence. He had reported being beaten by guards in the prisons he was previously held in, in Sevilla in 2013, Puerto III in 2010 and Algeciras in 2008. His death was caused by a pulmonary edema, and he was the third Basque prisoner to die of illness in jail in the space of one year. 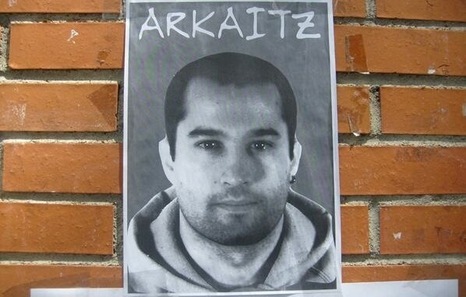 If Arkaitz had been an ordinary prisoner he would have qualified for early release under Spanish law as he had served more than three-quarters of his sentence. But refusing to apply this law is another one of the exceptional measures used by the Spanish government against Basque prisoners. Refusing to release seriously ill prisoners on parole is yet another exceptional measure used against Basque prisoners. According to Etxerat (Home), the prisoners’ relatives association, there are currently nine prisoners in jail who are suffering from serious and incurable illnesses, including multiple sclerosis, AIDS, and cancer. Ordinary prisoners receive this right under Spanish law, and it is enshrined in two binding United Nations human rights conventions, which Spain is a signatory to. Repeated transfers, mistreatment, beatings and solitary isolation are also commonly used against Basque prisoners. The policy of dispersion was introduced by the Spanish government as a hardline punitive measure following the failure of the first negotiations between ETA and the Spanish government held in Algeria in 1989.
International human rights organisations and the UN have long been calling on the Spanish government to end the policy. It contradicts a UN resolution (‘Body of Principles for the Protection of All Persons under Any Form of Detention or Imprisonment’) adopted in 1988 that states: “If a detained or imprisoned person so requests, he shall if possible be kept in a place of detention or imprisonment reasonably near his usual place of residence.” The principle is aimed at defending the right of prisoners to maintain their family connections, and their connections with trusted legal representatives and physicians. Dispersion not only infringes the right of prisoners to maintain their family ties; it punishes the families themselves, who are forced to make round trips of, on average, 1,400km every weekend to visit their relatives at an average expense of €20,000 per year. Etxerat has recorded the number of traffic accidents relatives have suffered in these trips – more than 400 since the introduction of the policy. Sixteen relatives of prisoners have been killed in such accidents. A punitive measure against Basque prisoners known as the Parot Doctrine was introduced in 2006, but has now been struck down by the European Court of Human Rights (ECHR). The doctrine, which was applied retroactively, meant remission for Basque political prisoners jailed before the introduction of the current penal code in 1995 could be granted on prisoners’ original full sentences instead of the 30-year maximum term. This effectively imposed life sentences. Parot was applied to 93 prisoners, including 71 who were still in jail when the ECHR ruled it was a human rights violation on 21 October 2013. Spain was forced to release them. However, the Spanish government is now pursuing another legally dubious path in an attempt to extend the sentences of Basque prisoners. A European Union Council Framework Decision adopted in November 2008 (2008/909/JHA), regarding the principle of “mutual recognition” of judgments and sentences among EU member states, means that Basque prisoners who have served time in French prisons should have these years counted as part of their total time served when they are transferred to the Spanish state. The Council Framework Decision had not been codified in legislation by the Spanish parliament, but Spanish courts applied it and discounted years spent in French jails for transferred Basque prisoners. The conservative People’s Party (PP) government has now legislated for its own interpretation of the Council Framework Decision, stating that it is not to be applied to prisoners sentenced after August 2010. This arbitrary date has nothing to do with the framework decision, which did not include any such limitation. This has caused confusion as to whether the EU decision or the Spanish interpretation should be followed, and prisoners have appealed its application. But appeals heard in the Supreme Court resulted in opposing decisions. The Grand Chamber of the Supreme Court was then convened on 16 December 2014 to hear an appeal. On 19 December 2014, 13 of the 18 Supreme Court magistrates publicly criticised what they said was an attempt by the Executive to interfere with the judiciary. Officials from the prosecutor’s office were pressuring the Court to disregard the EU decision. The Supreme Court decision has now been postponed until 13 January. If the government pressure succeeds, 50 Basque prisoners could have their sentences illegally extended. Prisoners’ relatives association Etxerat said in December 2014 that it fears a massive transfer of prisoners from the French to the Spanish state is being planned under the Framework Decision, and that Spain will use the transfer to move these prisoners even further from home, including to prisons as far away as Africa. The Spanish government is in the contradictory position of trying to deny the political dimension of the conflict by insisting the Basque prisoners are common criminals and not political prisoners, while at the same time singling these prisoners out for special punitive treatment. For 26 years, successive Spanish governments have insisted that in order for a prisoner to achieve an end to the use of punitive exceptional measures, he or she must individually renounce the use of violence and acknowledge the suffering caused by ETA. 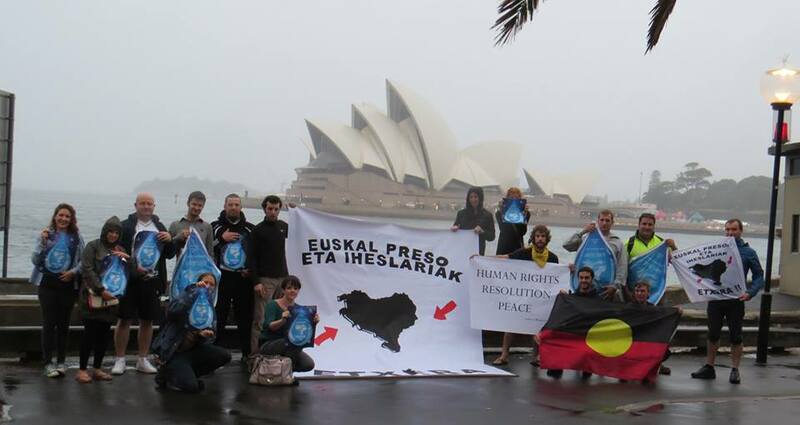 The Basque Political Prisoners Collective (EPPK) has historically resisted meeting these conditions. On 28 December 2013, the EPPK released a statement in which it confirmed its support for the ETA ceasefire and the development of a peace process. It recognised the suffering caused by the conflict, and committed for the first time to aiming for the repatriation of prisoners on an individual basis through engaging with the Spanish legal framework. In essence, it meant Basque prisoners collectively accepted the legitimacy of the Spanish justice system for the first time. Characteristically, Spain responded less than two weeks later by arresting and jailing eight EPPK mediators, including two lawyers, on 8 January 2014. They claimed the EPPK, and therefore its mediators, was an “operational arm of ETA”. In March 2014, in accordance with the EPPK announcement, a number of prisoners began individually engaging with the legal system to fulfil requirements and request transfer to Zaballa jail in the Basque province of Alava. Prisoners with serious and chronic illnesses, and those over 70, filed requests asking for parole or house arrest. By July 2014, every single one of more than 65 requests for transfer or parole had been rejected. The rejections claimed the fact the prisoners had met all of the previously stipulated conditions wasn’t good enough, as the members of the collective had not “broken with the discipline of ETA”. The discipline of ETA – or rather, of the EPPK, which includes all Basque political prisoners – resulted in a collective renouncement of the use of violence, acknowledgment of the suffering caused, and recognition of the Spanish justice system’s authority. The collective made a difficult political decision and a historic compromise in order to achieve repatriation as a crucial peace-building measure. The abuse of prisoners’ rights, and the widely documented use of torture by the Guardia Civil during the standard five-day incommunicado detention of political suspects, have long been among the most emotive issues in Basque society. The torture and mistreatment of political prisoners during the four-decade dictatorship of General Franco created a profound abhorrence among Basques for such abuses that continues to be deeply felt today, across the political spectrum. Months after ETA announced a permanent ceasefire in 2011, a massive demonstration for the repatriation of Basque prisoners was held in Bilbao in January 2012. One hundred thousand people marched. As a result of the groundswell of support for the campaign, a broad alliance of Basque civil society formed and legally registered ‘Herrira’ (Return Home) the following month, a committee that would campaign for the end to the dispersion policy. Herrira organised a march for repatriation in Donostia/San Sebastian in January 2013 that swelled to 115,000 people. In September 2013, the Spanish government launched a series of raids against Herrira, shutting down the organisation and charging 18 of its activists with terrorism offences. Never deterred, supporters of the campaign for repatriation quickly formed a new organisation, Tantaz Tanta (Drop by Drop), and called for the annual demonstration for an end to dispersion to be held in Bilbao in January 2014. But Judge Eloy Velasco from the Audiencia Nacional banned the march on the grounds that Tantaz Tanta had “links” to Herrira. Tantaz Tanta cancelled the march but the ban provoked outrage and forged unity among all sections of Basque nationalist opinion. Basque abertzale left party Sortu and its affiliated trade union confederation LAB immediately worked together with the conservative PNV (Basque Nationalist Party) and its affiliated union the ELA to call for a new march on 11 January 2014 – which drew 130,000 people out on to the streets of Bilbao. 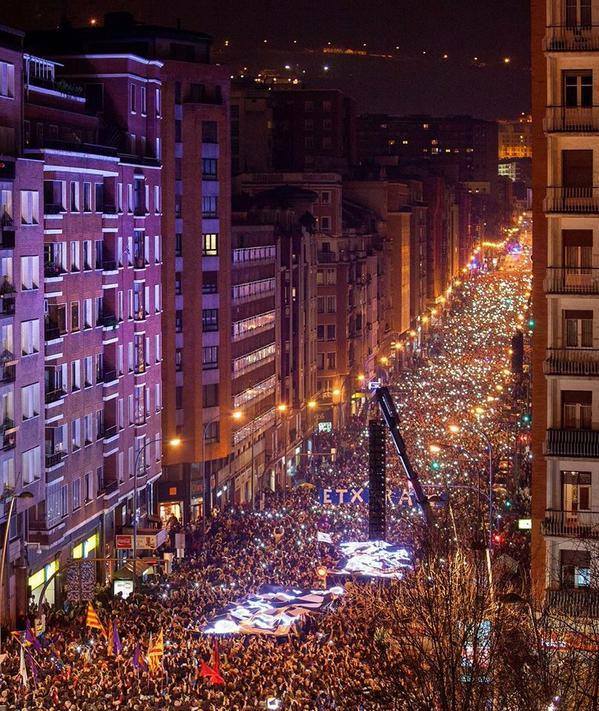 It was the largest protest in the history of the Basque Country, and it called for ‘Human Rights, Resolution, Peace’. It was the first time since 1998 that the PNV and abertzale left held such a joint demonstration. Yet another new organisation, Sare, was launched in September 2014 after Velasco’s attempt to criminalise Tantaz Tanta. In a stadium filled with 10,000 people, and addressed by Basque political figures, celebrities and cultural figures, Sare pledged to work for the repatriation of prisoners; for the release of seriously ill prisoners; and for the release of all those who have been jailed for purely political work. It has already distributed half a million copies of its ‘Book of Dispersion’ around the world. Madrid’s intransigence is becoming increasingly difficult to justify as international pressure builds for the Spanish and French governments to grasp this historic opportunity for a comprehensive resolution to the long Basque conflict. And Basque society is becoming increasingly unified and mobilised in its demand for human rights and a peaceful resolution. The Spanish government’s response to the move by armed Basque pro-independence organisation ETA to put its weapons beyond use has demonstrated beyond doubt that it favours the continuation of conflict over peace. On 21 February, ETA (Euskadi ta Askatasuna – Basque Homeland and Freedom) released a video showing two of its members meeting with representatives of the International Verification Commission (IVC) who were inspecting a quantity of weapons that had been put beyond operational use. The IVC held a press conference in Bilbao in the Basque Country the same day, at which spokesperson Ram Manikkalingam said: “The commission is confident that this step is significant and credible.” The Amsterdam-based IVC is not recognised by the Spanish government. It consists of six high-profile international experts in conflict resolution, and was formed in 2011 with the purpose of monitoring and verifying ETA’s permanent ceasefire. As well as Sri Lankan Manikkalingam, who has worked in conflict resolution in Sri Lanka, Iraq and Ireland, the IVC also includes South Africa’s former deputy defence minister Ronnie Kasrils and former political director of the Northern Ireland Office Chris Maccabe. The Spanish government’s response to the decommissioning move was to issue subpoenas to the members of the IVC for interrogation, summoning them to the Audiencia Nacional, Spain’s political court in Madrid, for interrogation. There is still a possibility that the IVC members may be charged with “assisting a terrorist organisation”. Chief negotiator for the British government throughout much of the Irish peace process, Jonathan Powell, wrote in the Financial Times on March 4 that the decommissioning move “appears to be unalloyed good news. But the reaction in Spain has been bizarre.” Powell urged the Spanish and French governments to legislate in order to make witnessing the decommissioning process legal. ETA published a statement on 1 March declaring it had begun the process of putting its entire arsenal beyond use. The other international organisation founded to assist the development of a Basque peace process is the International Contact Group led by South African lawyer Brian Currin, which aims to facilitate dialogue between the main actors. While attending a peace conference in Baiona in the northern Basque Country (within the French state) on 28 February, Currin and other members of the ICG were summoned to Paris by a French court to face questioning over their contacts with ETA. ETA was formed by a group of Basque students in 1959 under the Franco dictatorship as a response to the regime’s attempt to eradicate the ancient Basque language and culture; the students believed that only an independent state could ensure the survival of the Basque nation. After launching its armed campaign against the Spanish military and the paramilitary police force, the Guardia Civil, in 1968, ETA played a leading role in the anti-Franco resistance. Its campaign for independence continued following the dictator’s death in 1975 as Spain’s ‘transition to democracy’ failed to allow the Basque people to determine their own political and constitutional arrangements. Only a minority of Basques voted in favour of the 1978 Constitution, which commits the armed forces to ensure the territorial integrity of the Spanish state. The continuing repression of both ETA and the broader Basque pro-independence movement – in particular, the widely documented use of torture by the security forces – after the transition has also fuelled the continuation of the conflict. ETA attacks have killed 829 people since 1968, and Basque nationalists estimate victims of state violence number 475. The Euskal Memoria Foundation has documented 9,600 cases of torture of Basque prisoners over the past five decades. Attempts to achieve a negotiated solution to the conflict began in the late 1980s. Basque ceasefires and negotiations in 1998 and 2006 broke down and armed actions resumed, but the desire for a negotiated solution has steadily grown among the Basque population. In 1998, fearful of the closer relationship between the abertzale (patriotic) left and the Basque Nationalist Party (PNV), the Spanish judiciary initiated a criminalisation strategy that claimed ‘everything that surrounds ETA is ETA’ – that is, any cultural organisation, political party or media outlet that supported Basque independence was deemed to be part of ETA. Mass trials against political activists began and have continued ever since, while newspapers were shut down and political parties including Batasuna were banned following the Law of Political Parties in 2002, a law which insists all parties must denounce anti-state violence or be banned. Former UN Special Rapportuer Martin Scheinin said in a UN report in December 2008 that this law defined ‘terrorism’ so vaguely that it “might be interpreted to include any political party which through peaceful political means seeks similar political objectives” as those pursued by armed organisations. The result has been a decade of disenfranchisement for supporters of the abertzale left. A new abertzale left party, Sortu, was founded in February 2011 and rejected violence, but the Spanish Supreme Court still refused to allow it to be legally registered. A challenge in the Constitutional Court, and international pressure on Madrid, resulted in Sortu being legalised conditionally in June 2012. The abertzale left, running in electoral coalitions Bildu and Amaiur in 2011 and 2012, won between 22 and 26% of the vote in the Basque Country, the largest support it has ever achieved. The disarmament move has been the latest in a series of unilateral acts by ETA taken since 2009 that aims to bring about the demilitarisation of the Basque political conflict with Spain and France, and initiate a process of conflict resolution that deals comprehensively with the consequences of the conflict, including disarmament, meeting the needs of victims, ending the exceptional measures used Basque political prisoners, and resolving the status of exiles. Not only has there been no concessions, but at each stage since the beginning of the peace initiative by the abertzale left in 2009, the Spanish government has reacted with repressive measures that have appeared at times to be unbelievably provocative. The abertzale left has responded to the provocation with an exceptional degree of cohesion, unity and discipline. The initiative – the announcement that a strategic debate was to be launched across the movement about a new ceasefire and peace process – took place despite the arrests at a press conference by more than 100 leading members of the Abertzale Left on 14 November 2009 in Altsasu. The Spanish government responded by launching massive raids across the Basque Country 10 days later, arresting 40 alleged members of political youth organisation Segi, 32 of whom later said they were tortured during their five-day incommunicado detention. The trial of the youth activists on terrorism charges began in October 2013 and is ongoing. ETA announced an end to offensive actions in 2010 as the strategic debate about an alternative strategy for achieving independence took place across the broader movement. On 17 October 2011 several international figures took part in an International Peace Conference, issuing the Declaration of Aiete – five recommendations that called on ETA to implement a definitive cessation of armed activity and request negotiations with the Spanish and French governments; and urged the governments to respond positively to such a request and put in place a process of addressing the consequences of the conflict. Former UN Secretary General Kofi Annan, Sinn Féin President Gerry Adams, former Irish Taoiseach (PM) Bertie Ahern, Powell, former Norwegian PM Gro Harlem Brundtland and former French Interior Minister Pierre Joxe issued the declaration, which was endorsed by former US President Jimmy Carter and former British PM Tony Blair. The Declaration of Aiete was later endorsed by many leading Latin American political figures in Mexico in October 2013, including 13 former presidents. Lula de Silva became the latest international figure to endorse Aiete following the IVC announcement in February. ETA responded to the Declaration of Aiete three days later by declaring a “definitive cessation” of armed actions. 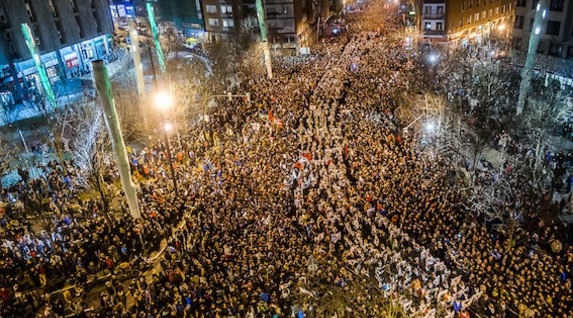 The groundswell of support among Basque society for an end to the conflict was demonstrated a few months later in January 2012 when around 100,000 people marched in a demonstration for the repatriation of the Basque prisoners. The number of Basque political prisoners – which include ETA activists but also hundreds of political and cultural activists, trade unionists and journalists as a result of the criminalisation policy – peaked at over 750 in 2010, the highest number since Franco’s death. In the wake of the massive show of support for prisoners’ rights in January 2012, a broad, legally registered, alliance formed the next month called Herrira (Return Home) to campaign for an end to the dispersal policy, an end to the Parot Doctrine and for the release of the seriously ill prisoners. Herrira organised an even bigger demonstration in favour of prisoners’ rights in Donostia in January 2013, which mobilised 115,000 people. The Spanish government introduced its ‘dispersal’ policy in 1989 whereby it aims to isolate and demoralise Basque prisoners by transferring them to prisons across the state, as far from home as possible. It is a policy that punishes both prisoners and their families and has been condemned by the UN and human rights organisations. The Parot Doctrine introduced in 2006, applied retroactively, meant remission for Basque political prisoners jailed before the introduction of the current penal code in 1995 could be granted on prisoners’ original full sentences instead of the 30-year maximum term, effectively imposing life sentences. It had been applied to 93 prisoners, including 71 who were still in jail when it was ruled illegal by the European Court of Human Rights on 21 October 2013. Spain was forced to release them. There are also 15 terminally or chronically ill prisoners who are denied the medical care they require in jail. After the release of the Parot prisoners, there are currently 521 Basque prisoners held in 82 jails across the Spanish and French states, on average 600kms from their homes. Just weeks before the ECHR ruling against the Parot Doctrine (which was widely expected to find in favour of the prisoners) the Spanish government struck pre-emptively by launching a major raid against Herrira on 30 September 2013, arresting 18 activists who were charged with terrorism offences and shutting down the organisation. The EPPK (Basque Political Prisoners Collective) released a statement on 28 December 2013 confirming its support for a peace process, recognising the suffering caused by the conflict, and committing for the first time to aiming for the repatriation of prisoners on an individual basis through engaging with the Spanish legal framework. Spain responded in on 8 January this year by arresting and jailing eight mediators of the EPPK, including two lawyers, on the grounds that the EPPK was an “operational arm of ETA”. 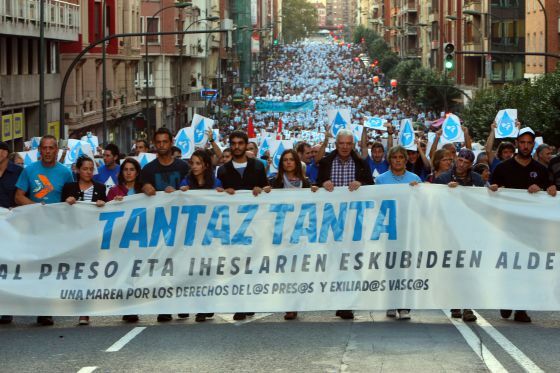 A new organisation, Tantaz Tanta (Drop by Drop), which was established after Herrira was shut down, planned to hold a march for prisoners’ rights in Bilbao in January but the demonstration was banned by Judge Eloy Velasco from the Audiencia Nacional on the grounds that Tantaz Tanta had “links” to Herrira. Tantaz Tanta cancelled the march but Sortu and the LAB joined with the PNV and its affiliated union the ELA to call for a new march on 11 January, which drew 130,000 people out on to the streets of Bilbao in the largest protest in the history of the Basque Country, under the slogan ‘Human Rights, Resolution, Peace’. It was the first time since 1998 that the PNV and abertzale left held such a joint demonstration. The Spanish government’s response to the IVC press conference demonstrates its growing sense of panic at ETA’s decision to exit the stage. In an interview from jail on 18 December with Mexico’s La Jornada, Arnaldo Otegi said: “The disappearance of ETA’s armed violence creates a serious problem for it, to the extent that there’s now no excuse not to tackle the real political debate, which is none other than respect for the Basque people’s right of self-determination.” The process could be immediately deepened and made irreversible by the repatriation of the prisoners to the Basque Country; yet instead it is likely that the Spanish government will step up its attempts to ban Sortu once again. Yet the unique opportunity to bring a four-decade armed conflict to an end has not gone unnoticed internationally, and Madrid’s active obstructionism to ETA decommissioning can be seen clearly as the deeply cynical move it is. Its stance is becoming increasingly hard to justify on the international stage. At the Sinn Féin Ard Fheis held last month in Dublin, Kattalina Madriagia, a pro-independence left former MP from the Basque Country, spoke to An Phoblacht’s Emma Clancy about the significance of the Basque Abertzale Left’s proposal for a democratic and peaceful process of political dialogue to begin. Madriagia explained that for several years, a process has been unfolding among the Basque Abertzale Left of trying to break through the barriers put up by the Spanish and French states that have frustrated the development of the movement for Basque independence. “In the past decade, the Abertzale Left movement, and Basque society in general, has experienced a surge in repression against us, in particular from the Spanish state forces,” Madriagia said. “Successive Spanish governments have stepped up their efforts to criminalise and isolate the pro-independence movement within Basque society, and internationally. “Today there are more than 750 Basque political prisoners, the highest number since the death of the fascist dictator General Franco in 1975. Torture in the prisons is widespread and well-documented. There is a wide array of repressive legislation in place that criminalises political parties, media outlets and cultural organisations. 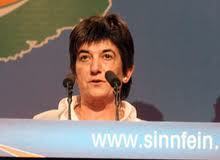 Following months of discussion and debate, a large conference of Abertzale Left representatives, including from Batasuna, made a public statement in February stating their commitment to using “exclusively political and democratic means” to advance their political objectives – in which the democratic will of the Basque people would be respected “in a complete absence of violence and interference”. Madriagia told An Phoblacht that this proposal was highly significant and needed the active support of all sections of Basque society and international involvement to succeed. “The proposal was received very well by the Basque people,” she said. “It was understood by Basque society, and supported by all the political parties and trade unions. Madriagia explained that the attacks on the leaders of the discussion process began before the document was even published. Eight high-profile left-wing political and labour leaders, including Batasuna leader Arnaldo Otegi, were arrested in October as a discussion paper was about to be published and charged with “trying to re-organise the leadership of Batasuna”. 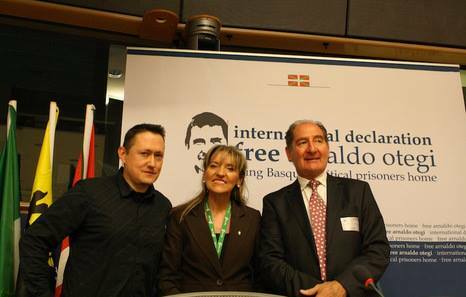 “[In March] Arnaldo Otegi was sentenced to two years in jail for ‘glorifying terrorism’ – on the basis of a speech he made at a rally in 2005 in which he compared a Basque political prisoner, who had been held in jail for 25 years, to Nelson Mandela. 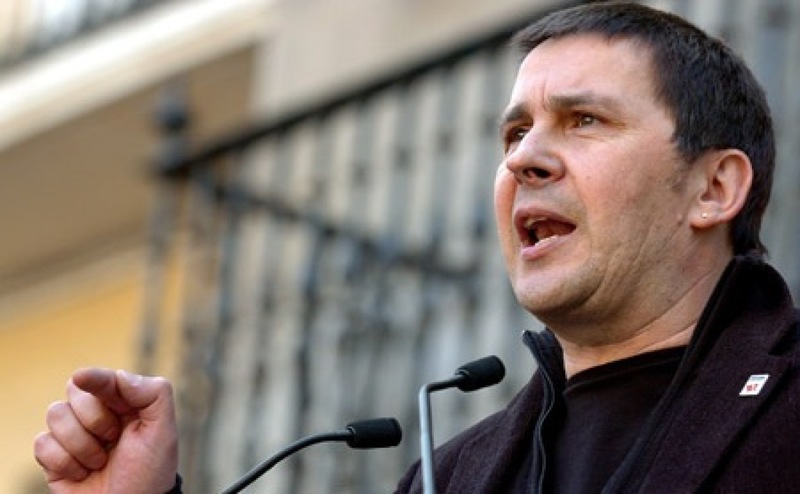 Otegi has also been banned from holding public office for 16 years. “We want to create a situation in which multi-party talks can take place, on the basis of the Mitchell Principles,” Madriagia said. 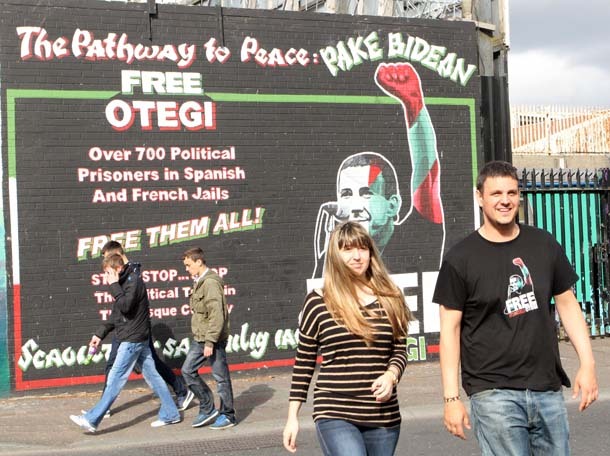 Madriagia said that she welcomed the response of solidarity from the Irish people to Basque ex-prisoner Inaki de Juana, who is fighting extradition to Spain from Belfast. “Every time we are at the doors of a new process, the repression intensifies, and the extradition attempts against Basques around the world are part of this. These actions do not help the development of a peace process – they help maintain conflict. Madriagia said that there was a vital need for other EU countries to now put pressure on the Spanish government to end its strategy of trying to strangle and silence the Basque call for engagement. “This is an important opportunity for progress that should not be wasted but we need to mobilise support internationally to achieve the construction of the new scenario envisioned in the Abertzale Left’s statement,” she said. On 16 March, ETA killed a French police officer in a shootout near Paris that resulted from a chance encounter between ETA members and police. The fatal shooting came days after the body of ex-prisoner and ETA member Jon Anza was found in a morgue in Toulouse. Anza’s disappearance in France last April is believed to have been caused by Spanish security forces, with the collaboration of the French security forces. In a statement, the Abertzale Left said both cases showed the urgent need to build a new scenario in the Basque Country based on its initiative launched in February. The pro-independence left expressed sorrow for the policeman’s death and called on ETA and the Spanish and French states to make clear commitments to reviving the democratic process. 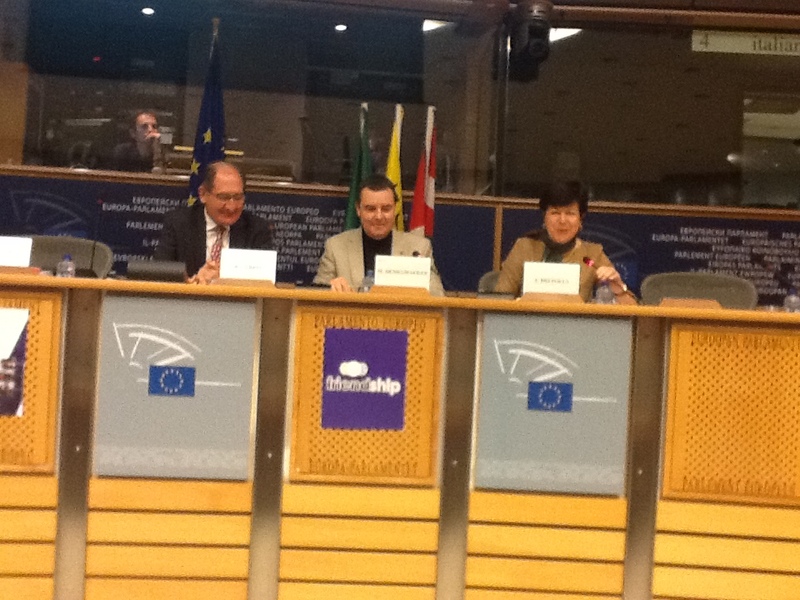 On 30 March a statement by international leaders, including former President of South Africa Frederick de Klerk, Archbishop Desmond Tutu, former Taoiseach Albert Reynolds and former Irish President Mary Robinson, was presented in the European Parliament commending the public commitment from the Basque Abertzale Left to using “exclusively political and democratic” means to attain its political goals. The statement called on ETA to support a permanent ceasefire and for the Spanish government to respond positively to such a declaration. Commenting on the publication of this statement, Sinn Féin President Gerry Adams said: “The conflict in the Basque country can only be resolved through political dialogue. It is clear from this statement that the international community want to help to create such a process. “The Irish Peace Process has shown the world that previously intractable conflicts can be resolved. Sinn Féin actively supports an inclusive process in the Basque Country. “It is now important that the opportunity presented by the political initiative taken by Abertzale Left and the positive statement from international leaders is grasped by both ETA and the Spanish government.